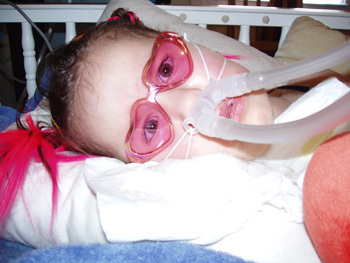 Born in San Germán, Puerto Rico, Deirdre was diagnosed with Spinal muscular Atrophy when she had a respiratory arrest at her 5 months of age. Deirdre looks strong, has a bewitching smile, and only smiles with her eyes when she trusts you. She enjoys all kind of music and loves toys with lights and movement. Deirdre looks like a normal child, but appearances are deceiving. Deirdre is VERY fragile, and a simple cold may kill her. Even if she cannot sit or walk or eat by mouth, Deedee loves to have fun, play and learn. She gets bored quickly. She is very intelligent, enjoys everything and responds to all. She allows you to know what she is thinking with her eye gaze and her expressions. She is also very sensitive, she likes being the boss so everything is done her way, and is deeply fond of The Little Mermaid, Wonder Pets (especially Ming-Ming) and She-Ra. Overall, Deedee is an action-oriented girl who definitively believes in girl power, and a diva who loves Disney heroines. Deirdre follows the Non-Invasive Protocol for her respiratory treatment, and follows the same daily routine for her respiratory care every day, twice a day (mornings and nights). 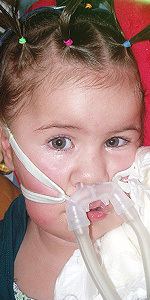 For details, look into her Physical and Respiratory Therapy section. To this day, the use of agressive physical therapy has been the key for keeping Deirdre alive and well. Deirdre do not use medicines, and uses a ventilator with Bi-Pap settings. She can be some hours without using the Bi-Pap on some days. She does not use oxigen. She does not has a tracheostomy, a very important fact as it is imperative that she is constantly supervised and constantly suctioned for she is at constant risk of respiratory arrest due to swallowing secretions or "mucus plugs". With constancy and vigilant care she can be happy and healthy, and do everything she wants. If you want to know more about Deirdre's Daily Care you can check and download her handbook of daily care (which is in the rigt column). The appendix includes information about SMA found on the main doctors/experts sites(Dr.Swoboda, Dr.Scroth and Dr. Bach). This manual describes the daily care for Deirdre Medina. This includes all therapies and respiratory issues, plus an appendix of supporting material. Copyright © 2012 KATABOLIC DESIGNS. Derechos reservados. Reproduction of material contained on this site for educational and non-commercial is allowed as long as you acknowledge the source. Reproduction of material for sales or other commercial purposes is prohibited without the written consent of the parents of Deirdre Medina. Requests to this end should be sent toVivian Rivera.